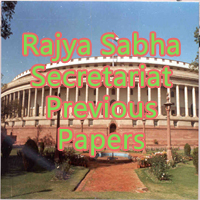 Rajya Sabha Secretariat Previous Papers PDF Free Download Links available. Candidates who had applied for the Rajya Sabha Secretariat Recruitment can now download the Rajya Sabha Exam Old Question Papers of Secretariat Assistant, Stenographer, Translator, various others. Visit the www.rajyasabha.nic.in for the Latest Rajya Sabha Exam Pattern and Exam Dates. Also, refer the India Parliament Model Question Papers PDF with their Solutions. For every competitive exam preparation, previous year question papers play a vital role. So, the applicants of Rajya Sabha can now start the preparation by making a proper preparation plan. Before that, you should download the India Parliament Exam Last 5 Years Papers PDF. But remember that, these Rajya Sabha Secretariat Previous Papers are only for the reference purpose. So, practice more number of asked questions from the www.rajyasabha.nic.in Translator, Stenographer Model Question Papers PDF. You can find the free download links of Rajya Sabha Parliamentary Interpreter & Secretariat Assistant Sample Papers PDF along with the Solutions in this article. The exact information about the Rajya Sabha Secretariat Exam Dates will be updated soon here. Recently, the Rajya Sabha Secretariat released the recruitment notice to fill 115 various vacancies. The Group I, II, III, IV vacant positions include Secretariat Assistant, Translator, Stenographer, etc., Interested candidates of Central Government Jobs can apply Online for the India Parliament Recruitment 2017 before the last date. The Deadline to submit Rajya Sabha Secretariat Online Application is 18th August 2017. The Online Application will be available on the official website www.rajyasabha.nic.in. Applicants begin the preparation for Rajya Sabha Secretariat Exam as early as possible. Candidates can refer the Rajya Sabha Secretariat Exam Pattern and download the Rajya Sabha Secretariat Previous Year Papers PDF. Get the Rajya Sabha Group I, II, III and IV Exam Model Papers from this page for free. Name of Organization Rajya Sabha Secretariat/ India Parliament. Assistant Legislative/ Committee/ Protocol/ Executive Officer. Jobs Category Group I, II, III, and IV. Last date for submitting Applications 18th August 2017. 1. Name Of Exam Rajya Sabha Secretariat Exam. 3. Examination Centers Ahmedabad, Allahabad, Bengaluru, Bhopal, Bhubaneswar, Chandigarh, Chennai, Dehradun, Delhi, Durgapur, Faridabad, Ghaziabad, Gurgaon, Guwahati, Hyderabad, Jabalpur, Jaipur, Jammu, Kochi, Kolkata, Lucknow, Madurai, Mumbai, Nagpur, Noida/Greater Noida, Panaji, Patna, Puducherry, Raipur, Ranchi, Shimla, Srinagar, Surat, Thiruvananthapuram, Udaipur, Vijayawada, and Vishakhapatnam. The tabular form represents the Secretariat Assistant English Exam Pattern 2017. First round for the Applicants is Written Examination (Prelims & Mains). Rajya Sabha Secretariat Assistant English Test consists of Three Parts: A, B, & C.
Part A consists of Objective Type Questions from the General Intelligence Topic. General Awareness Questions are asked in Part B. Third part expected to have English Language Questions. The time duration of the test is 3 Hours i.e., 60 Minutes for each section. For more jobs Rajya Sabha Secretariat Exam Pattern 2017, you can go through the following link. You may also download the Rajya Sabha Exam Syllabus PDF. Here, we have provided the direct links to get the Rajya Sabha Exam Old Question papers PDF along with the Solutions. Candidates who are searching for the India Parliament Secretariat Assistant Previous Papers can find them here. Since the jobs belong to Central Government Jobs, applicants should have perfect preparation. It may be a little bit tough to get the Job in Rajya Sabha Secretariat. So, th applied candidates can begin the exam preparation by checking the exam pattern and downloading the practice papers. Visit the Official Website www.rajyasabha.nic.in for the latest updates about the Rajya Sabha Secretariat Exam Dates 2017. We are also providing the tentative India Parliament Group I, II, III and IV Exam Dates and Schedule, Exam Centers. Get the Rajya Sabha Secretariat Assistant Last 5 Years Question Papers, Parliament Stenographer Sample Question Papers, and www.rajyasabha.nic.in Parliamentary Assistant Practice Papers along with the Answers of asked questions. Candidates are suggested to refer these Rajya Sabha Secretariat Previous Papers for reference purpose only.